These two wars fed on one another, with American’s aligning themselves in camps for and against Vietnam, and black activists and soldiers questioning why they should serve a country that denies them their basic civil liberties. 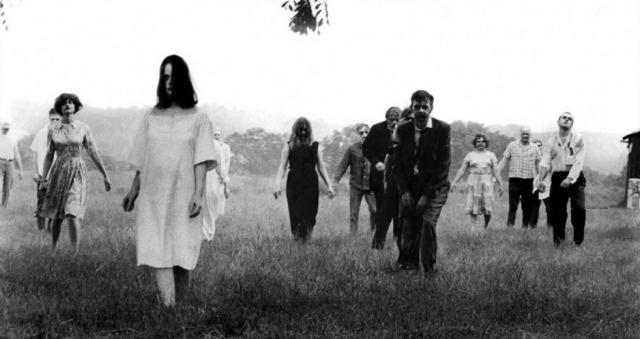 Likewise, the zombie attacks depicted in Night of the Living Dead act as a sort of pressure cooker for the real conflict of the film, the one being fought amongst the desperate inhabitants of the farmhouse. While neither the Vietnam War, nor the Civil Rights movement are specifically addressed in the film, their historical influence can be felt in every frame. The society Romero depicts is a frightened, angry and nihilistic America, echoing the cultural tensions in which the film was made. Romero uses his “ghouls” to express the fear and disgust many American’s felt in their exposure to the Vietnam War. Vietnam was the first time ordinary citizens were able to witness the gruesome reality of armed conflict. War was no longer an abstract struggle in a far-off land; it was being transmitted into people’s living rooms daily. Like the media’s coverage of the war, Night of the Living Dead is shot in grainy black and white, giving the film a seedy, voyeuristic feel. The frame often seems frantic and unfocused, and the audio is riddled with un-synced dialogue and fluctuating volume. Romero’s loose, shaky camera-work also contributes to this sense of gritty realism, as does his decision to employ non-actors for several parts. Night of the Living Dead is much less staged and polished than the high-budget films of its era, but rather than detract from the experience, it serves to emulate the wartime journalism audiences would have been exposed to on television during its release. This stylistic choice helps create a subconscious dialogue between the gruesome imagery of the zombie attacks, and shocking video journalism of Vietnam. In both cases, the prevailing response from viewers was to question why so many people were dying, and if their deaths even meant anything, or served any greater good. Strangely, the only time the camera seems centred and focused, is when the characters are all silently watching the television set. The news updates have a calming influence over the bickering parties, and alludes to their prevailing trust in the media’s authority and desire to be told what to do. In this sense, the film presents a pessimistic view of people. Without an authority figure, the characters are unable to work together. They argue and fight, and end up harming each other more than the zombies themselves. Likewise, the living dead are an aimless, mindless and savage mob, a representation of the most basic instincts of people, free from direction or authority. Unlike the previous wars of that century, which unified America against a common enemy, Vietnam was having a destabilising effect, pitting citizen against citizen, and undermining the authority of the government and military. The ghouls in Night of the Living Dead embody the faceless, nameless people slaughtered in service of America’s war. They are the dead soldiers, the defiled civilians, and the Viet Cong. The ghouls are America’s guilt given form, returned to extract revenge on the people who watched their horror in the quiet comfort of the living room. For the first time American’s did not see themselves as the good guys in this conflict. They were not fighting Nazi Germany or the Empire of Japan. Their enemy was the mysterious man in the black pyjamas, the one they called “Charlie”. He was everywhere and nowhere, a faceless mob waiting behind the next line of trees. He took the form of farmers and peasants, and sometimes even women and children. The ghouls fear fire, not for its heat, but for its light. Like the Viet Cong, they are stronger in the shadows, where friend is indistinguishable from foe. This formless, illusive presence created as much frustration and paranoia in the American soldiers as it does in the inhabitants of the farmhouse. Both Barbra and Mrs Cooper see the face of a loved one, when confronted by a ghoul, and empathise with it. It costs them their life. The racial tensions of 1960s America manifest themselves through the character of Ben, and his efforts to cope with hostility inside and outside the farmhouse. An African-American in a starring role was rare for that time period; rarer still, was the fact that neither the characters, nor the film, reference Ben’s race. His skin-colour is neither the subject of approval or disapproval. He is judged purely on his ability to survive. In this sense, the zombie attacks have created a sort of levelling effect, erasing the old racial divides, at least for the moment, in favour of a blanket human survival. On the other hand, the members of the farmhouse are hardly a united front. Ben seizes leadership over the group, even resorting to violence to assert his dominance. If the farmhouse is a microcosm of “living” America, then Ben is its clear defender, skewing the social perceptions of black subjugation. Ben does not simply assert his equality over the white survivors, but his dominance. One line in particular—“you’re boss down there, and I’m boss up here”—even suggests a sort of black supremacy over the house. Alluding to black militant figures like Malcolm X and the Black Panthers, Ben is using the deterioration of society to reorganise the racial hierarchy, elevating himself from a level of subjugation to authority. In the closing moments of the film, Ben emerges from the cellar, traumatised from the night before, but ultimately unharmed. Then, in a scene of utter nihilism, he is mistaken for a ghoul by the gun-toting posse, and shot dead through the farmhouse window. It is unclear whether this action was aggravated by racism, or simply poor judgement on the part of the gunmen. In either case, the posse failed to acknowledge Ben’s humanity, and slew him with the same callous attitude afforded the rest of the bodies cast onto the pyre. The film has brought us to a point where American’s can no longer distinguish between the living and the dead, and have begun to devour one another indiscriminately through fear and paranoia. Even if Ben’s murder was not racially motivated, Romero’s depiction of a southern militia stalking through the country side armed with rifles, hunting dogs and meat-hooks is clearly meant to provoke images of the 1960s lynch mobs. Night of the Living Dead echoes the disillusionment felt by many American’s during its release. So many soldiers and activists had died, and worse still, their deaths seemed random and without purpose. America was devouring itself, and this feeling of cultural decay and social hysteria manifests itself with shocking intensity in Romero’s film.